Blister packs are used to package products such as toys, hardware, medication, etc. Many blister packaging machines use heat and pressure via a die to form the cavity or pocket from a roll or sheet of plastic. In recent years, improvements in cold forming, specifically allowing steeper depth/angles during forming, which minimizes the amount of material used for each cavity—have helped this technology increase. 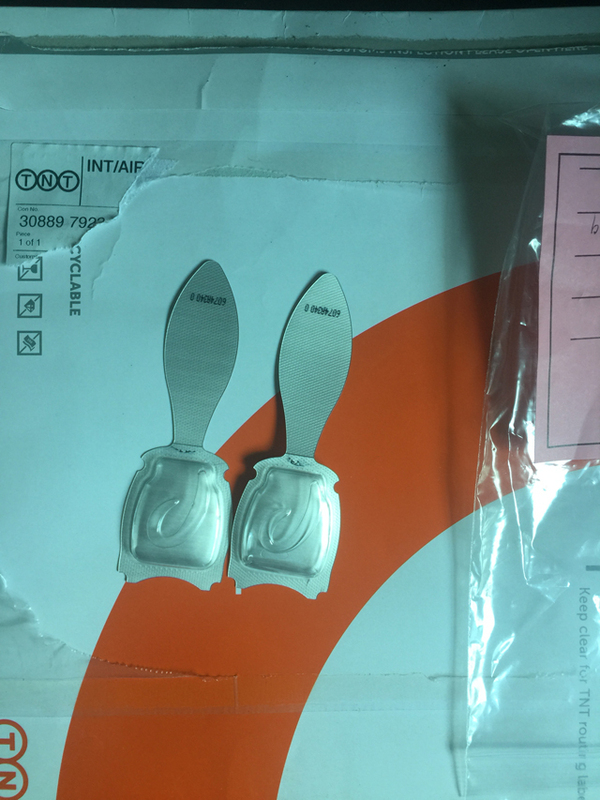 The main advantages of the plastic-based blister pack are its more compact size compared to cold formed aluminum and its transparency to see the product. The most basic material for the forming web is polyvinyl chloride (PVC). The principal advantages of PVC are the low cost and the ease of thermoforming. The main disadvantages are the poor barrier against moisture ingress and oxygen ingress. 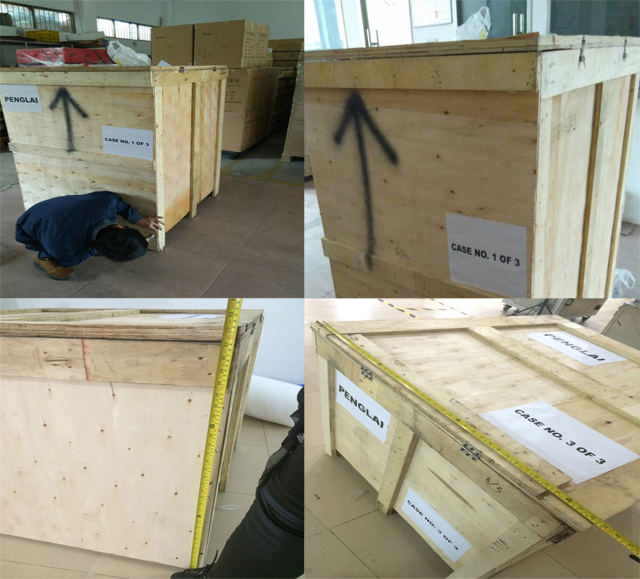 In the case of blister packaging the PVC sheet does not contain any plasticizer and is sometimes referred to as Rigid PVC or RPVC. In the absence of plasticizers, PVC blisters offer structural rigidity and physical protection for the pharmaceutical dosage form. On the other hand, the blister cavity must remain accessible by the push-through effect and the formed web may not be too hard to collapse when pressed upon; for this reason the PVC sheet thickness is typically chosen between 200µ to 300µ depending on the cavity size and shape. Most PVC sheets for pharmaceutical blisters are 250µ or 0.250 mm in thickness. Typical values for the Water Vapor Transmission Rate (WVTR or MVTR) of a 250µ PVC film are around 3.0 g/m2/day measured at 38 °C/90% RH and the Oxygen Transmission Rate (OTR) is around 20 mL/m2/day. In order to overcome the lack of barrier properties of PVC film, it can be coated with PVDC or laminated to PCTFE or COC to increase the protective properties. 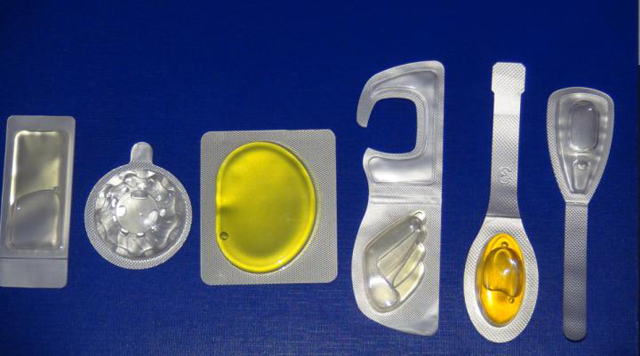 Multi-layer blister films based on PVC are often used for pharmaceutical blister packaging, whereby the PVC serves as the thermoformable backbone of the structure. Also, the PVC layer can be colored with pigments and/or UV filters. The European Pharmacopoeia (Ph Eur) references the requirements for PVC blister packs for pharmaceutical primary packaging in the monograph EP 3.1.11 "MATERIALS BASED ON NON-PLASTICISED POLY(VINYL CHLORIDE) FOR CONTAINERS FOR DRY DOSAGE FORMS FOR ORAL ADMINISTRATION". 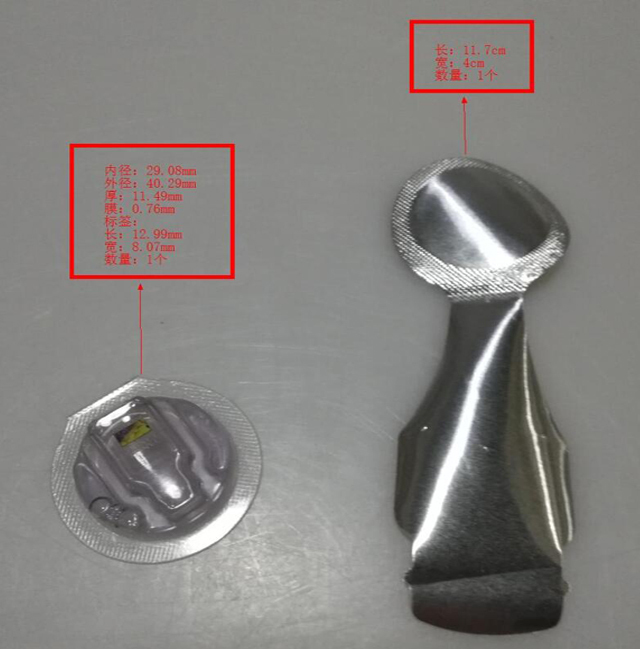 In order to be suitable for pharmaceutical blister packs, the PVC formulation also needs to comply with the US Pharmacopoeia <661>; EU food legislation; US 21.CFR and Japanese food contact requirements. Polyvinylidene chloride or PVDC can be coated onto a PVC film to obtain very high moisture and oxygen barrier properties depending on the coating weight. 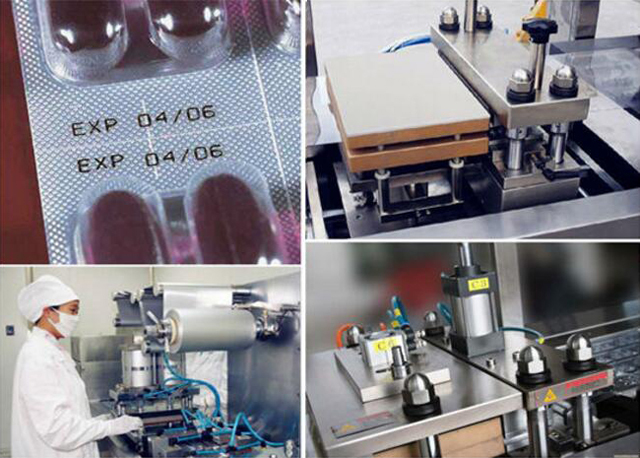 PVDC coated blister films are the most common and prevailing barrier films used for pharmaceutical blister packs. PVDC coatings are also the most economical method for adding water barrier and oxygen barrier properties to a PVC film. PVDC blister films are available in 2 or 3 layer specifications referred to as duplex or triplex. Since the PVDC is applied by a coating process, the coating weight is expressed in grams per square meter (gsm). Duplex structures are typically PVC/PVDC films, ranging from 250µPVC/40gsmPVDC to 250µPVC/120gsmPVDC with WVTR from 0,65 to 0,25 g/m2/d and OTR from 1 to 0,1 cc/m2/d. For very deep draw thermoformed cavities, the triplex specifications are used : PVC/PE/PVDC, where the PE layer assists when forming deeper cavities. The PE (polyethylene) forms a soft intermediate layer between the rigid PVC and PVDC layers. Triplex specifications exists in similar coating weights as duplex specifications: 250µPVC/25µPE/40gsmPVDC up to 250µPVC/25µPE/120gsmPVDC. In order to obtain high barrier properties, PVDC is always applied using an emulsion coating process using a PVDC resin dispersed in water. The film producer applies the coating in several steps, drying-off the water between each coating station. PVDC grades are available in 2 types of polymer: (I) the historic grades offering medium to high barrier properties and (II) a super barrier coating grade offering the highest barrier. The super barrier coating grade has over two times the barrier to moisture and oxygen per gram coating weight compared to the historic grades. The most common structures using the super barrier PVDC are triplex configurations 250µPVC/25µPE/120gsmPVDC up to 250µPVC/25µPE/180gsmPVDC, with WVTR of 0,11 down to 0,06 g/m2/day and available from various suppliers. Polychlorotrifluoro ethylene or PCTFE can be laminated to PVC to obtain very high moisture barrier. 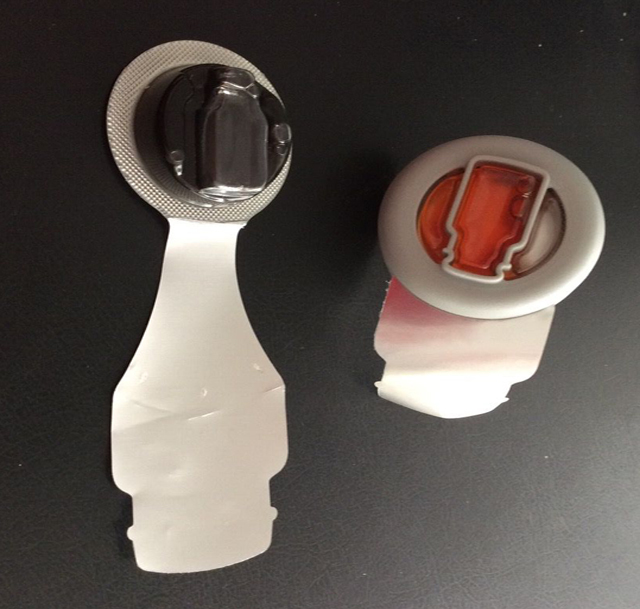 Typical constructions used for pharmaceutical products are 250µ PVC film laminated to 15µ-150µ PCTFE film. Duplex structures are PVC/PCTFE and triplex laminates are PVC/PE/PCTFE. Deeper cavities can be formed by using the triplex structures with PE. Typical WVTR values are 0.06–0.40 g/m2/day.PCTFE films have the lowest water vapor permeation compared to all other plastic films used in blister packaging and have thermoforming properties similar to plain PVC though it is also the most expensive.Despite narrow thermoforming temperatures and required cooling steps PP is increasingly popular. This popularity is due in part to it not suffering the environmental liability that PVC suffers in discharging hydrochloric acid during incineration. Unplasticised PVC has good thermoforming properties but may not provide good moisture protection for some products. After the forming process a 250 µm film will have a final thickness of 50 to 100 µm in some deep drawn pockets.The reduction in thickness will result in an increase in WVT. Cyclic olefin copolymers (COC) or polymers (COP) can provide moisture barrier to blister packs, typically in multilayered combinations with polypropylene (PP), polyethylene (PE), or glycol-modified polyethylene terephthalate (PETg). Cyclic olefin resins are generally amorphous and are noted for good thermoforming characteristics even in deep cavities, leading some to use COC in blister packaging as a thermoforming enhancer, particularly in combination with semicrystalline resins such as PP or PE. Films can be manufactured via coextrusion or lamination. WVTR values of commercial cyclic olefin-based pharmaceutical blister films typically range from 0.20 to 0.35 g/m2/day at 38 °C/90% RH. Unlike PVC and other common pharmaceutical barrier resins, cyclic olefin resins do not contain chlorine or other halogens in their molecular structure, being composed solely of carbon and hydrogen. Cyclic olefin resins are available which comply with pharmaceutical packaging guidelines in the US, Europe, and Japan. Cold Form Foil film is made of a 3-layer laminate: PVC/Aluminum/Polyamide. The PVC side is on the inside in contact with the product. 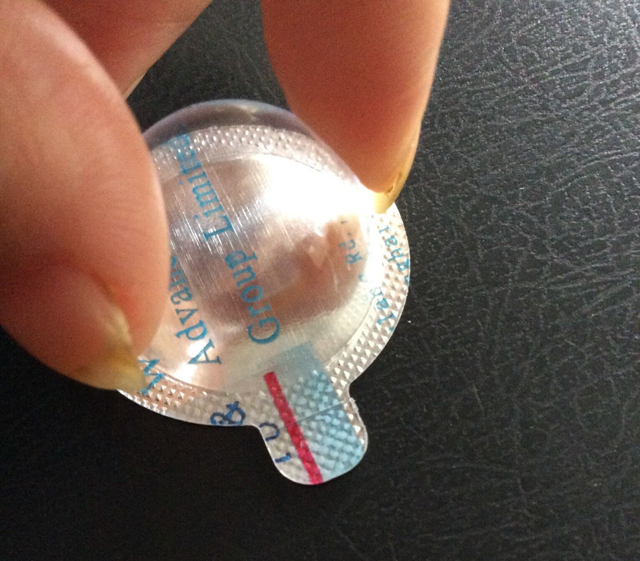 Pharmaceutical blister packs are mostly closed by a push-through or peel-open lidding foil. The most common lidding foil with push-through features is 20µ hard temper aluminum, which can be supplied pinhole-free from the producers. The lidding foil is coated with a heat-seal lacquer on the inside and a print primer on the outside. 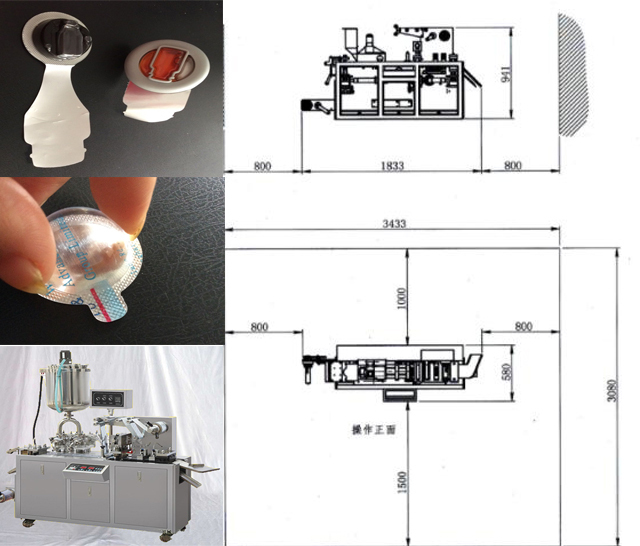 model YX-DPT80A-02 blister packing machine is a new product designed for industry of hospital, medium-size and small-size pharmaceutical plant, health care product plant, such us capsules, tablets, penicillin bottle, ampoule, oral liquid,olive oil,candy and so on. It has small size of body, easy operation, long durability and much performance. Its function has reached domestic leading level. 1 Adopt the interface of human-machine and PLC programmable controller. 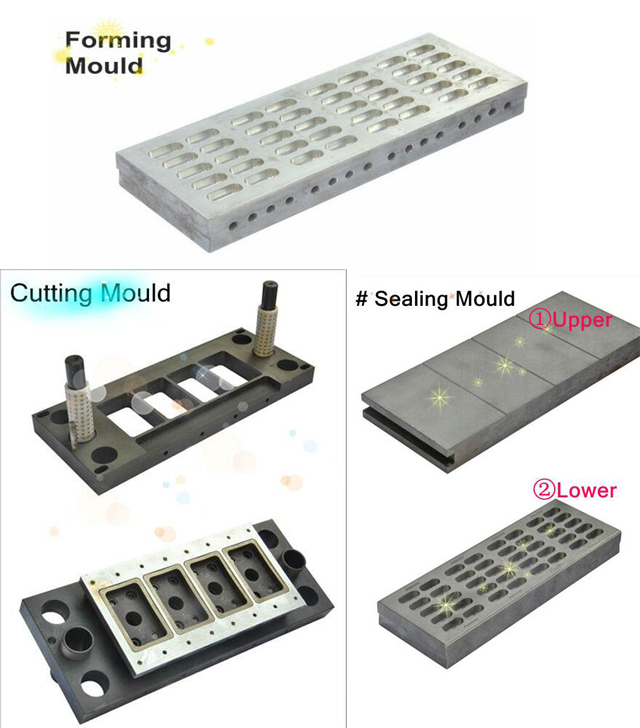 2 Mould is located by locating groove, so that it’s easy to change mould. Adopt cool-forming moulds. 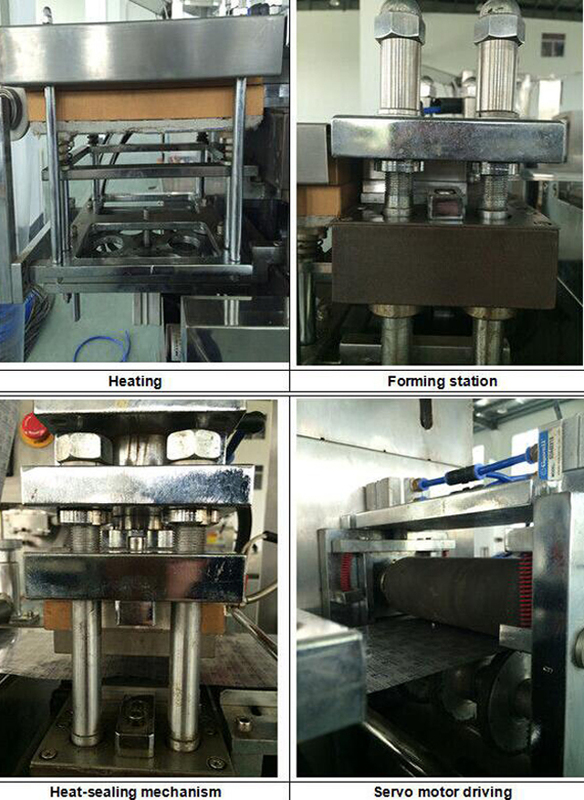 3 The equipment of trace pressing, batch number printing and scarp-collecting is adjustable. 4 Stepping motor drive wheel to grip and tow wrapper. The process is synchronized, and accurate. 5 The heating moulds will automatically separate when the machine stops, which contributes to protect the material between them and extend the machine`s life. 6 The device of recycling waste materials. 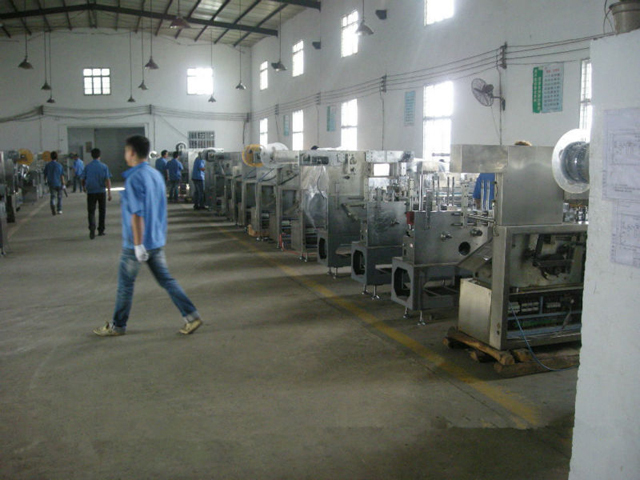 7 We can design different mould and feeder according to customer’s requirement.